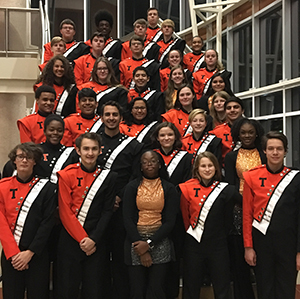 Texarkana, TX – During auditions held on December 7 at North Lamar High School in Paris, TX, thirty-three Texas High School band students earned placement in the Texas Music Educators Association All-Region Band. Nine students advanced to earn All-Area status. Selected students will perform in an Honor Band Concert in January in Mt. Pleasant, TX. Those students named to the All-Region Band are: Christian Allen, Emma Allen, Matt Allen, Skylar Allen, David Bell, Martha Bratcher, Hershall Caldwell, Lucy Castaneda, Connor Corbett, Craig Crawford, Madaline Criddle, Tien Doan, Chris Gilliland, Chloe Griffin, Cassidy Harris, Caden Jean, Grey Johnson, Molly Laird, Josh Lauterbach, Assad Malik, Jalena McDermott, Hope McDonald, Ana Moreno, John Morgan, Harmony Mothershed , Guillermo Pass, Jhovany Perez (Piccolo & Flute), Madisyn Points, AJ Reed, Reed Russell, Macy Sloan, Jenna Woodard and Kate Woodard. Earning All-Area status were: Matt Allen, David Bell, Hershall Caldwell, Craig Crawford, Tien Doan, Molly Laird, Jalena McDermott, John Morgan and Jhovany Perez.